Tickets go on sale at 9am on Friday 24 October. Please note that there will be no in-person sales from the Royal Albert Hall Box Office for these concerts. Tickets can be bought online or by calling the Box Office on 020 7589 8212. 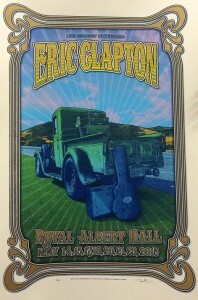 Music icon Eric Clapton will return to the Royal Albert Hall in 2015 with 7 shows to celebrate his 70th birthday. The shows will also mark 50 years since Clapton first played at the iconic London venue – his debut was on 7 December 1964 when he performed as part of the Yardbirds for BBC Two’s Top Beat Show. To date, the legendary guitarist has played the Hall on 197 occasions, including 171 headlining performances. Eric will be accompanied by his band members Paul Carrack, Steve Gadd, Nathan East, Chris Stainton, Sharon White and Michelle John.